Red Dead Redemption 2 is full of distractions. There’s poker, blackjack, and dominos to play. There are animals to hunt and collectibles to find. Many of these activities seem like ways to take your mind off the main story, and you can easily ignore them to focus on the game’s more pressing matters. But one piece of side content, the vaudeville show in Saint Denis, is more than just a distraction, and it’s worth stopping to watch. Saint Denis is a city in Red Dead 2 modelled after New Orleans. It’s a contrast to the rest of the game’s wilderness, both visually — with its crowded streets and belching smokestacks—and narratively, symbolizing the changing world that’s making the lives of the game’s main ensemble, Dutch’s gang, obsolete. 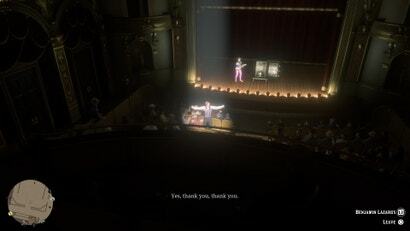 One of the city’s many landmarks is the Theatre Raleur, where protagonist Arthur Morgan can see a series of vaudeville acts over the course of several nights. For a couple dollars, you can watch a magician catch a bullet in his teeth, a woman dance with a giant snake, a honky-tonk quartet, some can-can dancers, and more. Each act is beautifully animated, with motion-capture some professional performers. The night’s lineup lasts around 15 minutes, and the performers or the content of their acts change each time you go. On occasion the show also features special acts related to stranger missions you might encounter in the world. The evening’s entertainment is hosted by a charming but self-effacing emcee who calls himself Aldridge T. Abbington. Though the acts themselves are engaging and dramatic, through Abbington’s framing and the personality of the performers, they become something more than a night on the town. In one act, simple magician’s trick becomes a story about far-off lands, fatherhood, and survival. 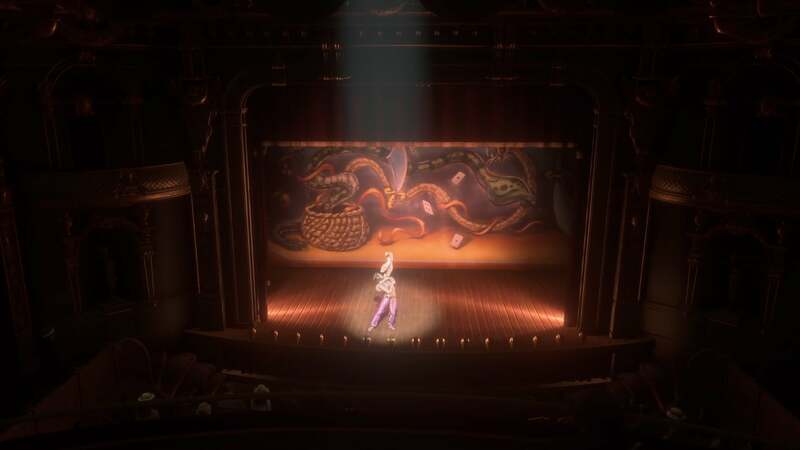 Red Dead 2’s vaudeville shows address many of the same themes as the game’s story, weaving the shows into the movements of the world outside the theatre. They explore how hope and imagination can transform the drudgery and dangers of daily life into something worth savouring. The stage shows are accurate for vaudeville acts at the time. In 1899, the year the game takes place, vaudeville was reinventing itself around the country as a classy form of entertainment, separate from burlesque shows or circus acts. The acts reached for theatrical legitimacy while still trying to appeal to a broad audience, so they often skirted the line between bawdy and high-minded. This shift changed things a lot for magicians. As author Jim Steinmeyer points out in his history of magic, Hiding the Elephant, vaudeville turned magicians from personalities with long acts into performers with a single hook, like card tricks or escapes. Vaudeville was meant to be at once elegant and refined, while also titillating and affordable enough to bring in someone as rough and tumble as Arthur Morgan. The game’s vaudeville show features one magician, the escape artist Benjamin Lazarus. In his shows, Lazarus catches bullets in his teeth, vanishes from a locked box to reappear in the audience, and attempts to escape a straightjacket while he has a noose around his neck. Lazarus is a Houdini-esque figure—in fact, some of the specific feats Lazarus brags of, such as demanding the police lock him up so he can escape, are things Houdini was attempting in 1899 in an effort to transform himself from a minor theatre performer into a legitimate star. Death. Madness. It is all around us. A beautiful wife of 14 years old suddenly dies of colic and pleurisy. A wealthy man goes mad and hacks his family to bits. Why? The mind is weak and yet it imprisons us all. Tonics and liquors keep the spirit buoyant as we all suffer all kinds of maladies in this life. These days you are just as likely to die as a man of 12 years old as you are a man of 42 or more. Despite his braggadocio, Lazarus’ tricks aren’t about his personal greatness. They’re about fear and agency, things Arthur and the rest of the audience struggle with daily. This is the promise of magic: familiar objects like cards and coins—or in this case, guns and steamer trunks — become vessels through which the performer tells an impossible story. Death is all around the show’s viewers, and though Lazarus claims to be the only one capable of cheating death, each of his spectators does it too, through money, power, community, or luck. Dutch’s gang cheats death through every complicated heist and ill-fated move to a new home. Dutch’s plans and Lazarus’ tricks both promise a transcendence of the ugly limits of the violence and death of Red Dead 2’s world. They don’t always succeed—Lazarus fails one of his tricks, and many members of Dutch’s gang die — but the effort feels transporting, even when it’s not successful. Other acts also reinvent daily dangers. Abbington’s vaudeville show features a fire dancer named Antoinette Sanseverino and a snake charmer called The Mysterious Maya. Antoinette spins lit torches and swallows flames. Maya dances seductively with a huge snake or balances a sword on various parts of her body as she twirls. Both performers’ acts are set to winding, sensual music, and they wear revealing outfits. Antoinette, Abbington tells us, is from Colombia, “where they do not wear clothes,” and he says that he “can attest that she does emit fire from almost every orifice in her body.” Maya’s backstory is less clear: In one show Abbington says he met her on a steamer to Morocco, but he also says she’s from Lagras, a small town in the bayou not far from Saint Denis. Despite being more or less local, Maya’s backstory is sold as exotic: Abbington spins tales about her seducing alligators into pots and says, “If only Eve danced so well with her devil, maybe humanity would still live in a garden of innocent grandeur, rather than a pit of depravity and despair.” These stories are condescending and fetishistic, but they seem to be in service of adding some romance and mystery to the everyday dangers the performers flirt with. Fire and swamp predators are pretty familiar to Arthur and the rest of the audience. Getting attacked by an alligator in the swamp is a terrifying annoyance; Maya coming too close to a snake is breathtaking. Placed on a stage, wrapped in sexuality and an international backstory, these encounters become daring and romantic, even desirable. Women aren’t just sexualized objects in the show, just as they play more complex roles in Red Dead 2’s society. The vaudeville show has a strongwoman, Hortensia, who rips phone books in half and has cement blocks broken over her stomach. She undermines gendered expectations of the time through her tattoos and boots, her grunts and flexing. Women play an awkward role in Dutch’s gang; they’re subservient in many instances, often tending to the daily needs of the men around them. In other moments, such as when Sadie proves herself against the Lemoyne Raiders after a fight with camp cook Pearson, or when Susan goes with Arthur to rescue Tilley, they prove themselves against the odds and against the expectations of their male companions. In the course of Arthur’s daily life, these moments are notable but fairly regular; the gang seems to have an understanding that women are just as capable as men, even if it sometimes causes clashes among gang members. Hortensia’s act both elevates and perverts this position — Hortensia’s strength is a spectacle, and she’s framed as an oddity whom Abbington says he found in Bavaria pulling a cart of manure. It also points out the game world’s gender gap specifically, turning women’s strength into something worth paying for. “What grand entertainment watching a reversal of the sexes,” Abbington says at the end of one of Hortensia’s acts, when she defeats a male challenger from the audience in a fight. In an effort to bring this entertainment to even the poorest dreamer of dreams, I have determined the ticket price should be very low, and the show held without a profit to me… For it is blessing enough to bring these gifted artists to you. Obviously Abbington isn’t actually providing these shows at a fiscal loss, and if he is it’s certainly not on purpose. But his patter frames the show as a meaningful experience earned through sacrifice for which the audience should feel grateful. This patina of sacrificing for others doesn’t feel all that different than gang leader Dutch’s air of put-upon dedication to his people. In Red Dead 2’s opening scenes, when Dutch praises the people the gang has lost, he says, “Now, if I could throw myself on the ground in their stead, I’d do it gladly.” It’s the same flair with which he offers himself up to the Pinkertons when they first come for the gang outside of Valentine. It’s a trick that predisposes his listeners to like him. Abbington, like Dutch, needs the audience’s sympathy because he doesn’t have all that much to offer. Vaudeville isn’t high theatre, and some of his acts don’t go well. To cover this up, he dresses the acts up in dreams and hope; he emphasises their importance over what the audience might wish they were. He tells us “entertainment is a gift that will see you through the winter better than any packed larder or root cellar full of canned goods.” It’s the same as Dutch trying to feed the gang with plans, faith, and promises of a safe place somewhere out there in the wide world, even as things go increasingly wrong. “I’m nothing but a seeker,” Dutch explains himself at one point, and he constantly tries to recast the gang’s predicament as something more than the natural consequences for their crimes. At the end of the day, both Abbington and Dutch’s words are just showman’s flair to obscure reality, but they both dress up the mundane as something more transcendent. All the acts are things Arthur can imagine doing every day, because he and his companions live them. The offhand aplomb with which these reminders are delivered seems to mock, or at least downplay, mortality. The contradiction between the seriousness and mundanity of death is reflected in Arthur’s life outside of the theatre. A lot of people die in Red Dead 2, at Arthur’s hand or the hands of the game’s enemies. Arthur himself is an agent of life’s tendency to “terminate without sense or meaning,” as Abbington tells it. At any moment Arthur can massacre the occupants of a bank, train, or entire town. There are moments of levity, too. There are parties, romantic dates, fun drunken nights. The game’s grittiness and clunky survival mechanics emphasise these moments as bright spots against a dark backdrop. Abbington’s monologues, along with the vaudeville show’s acts, follow the same rhythm as Red Dead 2 itself: joy swerving into despair, then back again. Maya’s act, like all the acts, are things Arthur can imagine doing every day, because he and his companions live them. He lives Benjamin Lazarus’ death-defying feats. He lives Maya and Antoinette’s flirtations with danger. He witnesses Hortensia’s strength. And yet, with a bit of polish from Abbington and a spiffy costume, the vaudeville show makes life’s grim reality a thing of whimsy and surprise, far more successfully than Dutch ever manages to. I was more impressed that Arthur can seamlessly insert himself into a handful of the acts. Hortensia wiped the floor with me, though.